When you leave a body of believers for one reason or another and look for another church home, it is not long before you face the realization that you will never find everything you are looking for. You start determining what your “deal-breakers” are. You are willing to live with some things you don’t agree with but some things you are not willing to live with (the deal-breakers). For example, to some this may be a church that teaches “once saved always saved (eternal security),” for some it may be just the opposite – a church that does NOT teach eternal security. For some it has to have a top notch worship band – for others, communion once a year is no big deal – the list is endless. When you search for a new church home, you read a lot of statements of belief to help you decide if it is even a church you even want to go in person to worship the Lord at in the first place. This is a paper I wrote several years ago as a result of our search. It is a fictitious Statement of Belief that I fantasized about finding in our search. I am sharing it with you as a result of a conversation that I had tonight with a brother in the Lord that I love very much! The ekklesia (Greek for assembly), or “church” as it is more commonly understood, is a koinonia (Greek for fellowship) of believers – they had everything in common, singleness of purpose and were united in community. It is in the book of Acts that we we find that they broke bread together daily, that they met in the temple courts daily and that they shared their food, property and possessions with each other and for those in need. The epistles (Greek for letters such as the ones Paul wrote such as Romans, 1st and 2nd Corinthians and Ephesians that would later became part of what we know as the New Testament today) where not to the unbeliever, but to the believer – Paul was writing ekklesia’s of believers such as the ones it Ephesus, Corinth and Rome. These believers consisted in the beginning of mostly Jews but were not devoid of Gentiles (non-Jews). They were persecuted and killed for their trust and belief in the Jewish Messiah Yeshua (Christ Jesus) together and without distinction. The leaders of the church at this time were Jewish and the bible that they knew and taught from then were from a collection of scrolls known as the Tanakh (Teaching, Prophets and Writings). Followers of Yeshua were martyred on crosses, beheaded and many other unspeakable acts. Yet they grew. Jewish and Gentile believers together, as brothers, in the prophesied Messiah and our King, Yeshua HaMashiach (Jesus the Christ). It is in this that the Even If . . . King Yeshua Koinonia is formed. Hebrew and Greek – Jew and Gentile – together. Just as the older covenants (old testament) inform the newer and better covenant (New Testament), the older ekklesia must inform the present ekklesia. This is not a Jewish roots movement ekklesia, it is an assembly of believers, an ekklesia comprised of Jewish and Gentile believers as brothers. Even If . . . is the statement that was made in Daniel 3:17-18 when King Nebuchadnezzar ordered Shadrach, Meshach and Abednego to bow down to his golden statue and worship. In their refusal to do so, a proclamation was made that “Even If . . .” God chose not to save them, they still would not bow down and worship any God but the one true God, the God of Abraham, Issac and Jacob. This is the trust and life we aspire to live as followers of Yeshua – an Even If . . . type of life. This statement sets the tone for all of our beliefs and understandings. It has to because these are the words that start His revelation to man that we know as the bible. YHVH or YHWH(Yahweh – the personal name of God) is one. Yeshua, the prophesied Messiah, the son of God who came to take away the sins of the world, and YHVH are one. One, alone, one and the same, only one, someone, anyone. Thoralf Gilbrant, ed., “1506A. εἷς,” in The Complete Biblical Library Greek-English Dictionary – Delta-Epsilon, (Springfield, MO: Complete Biblical Library, 1991), WORDsearch CROSS e-book, Under: “1506A. Îµá¼·Ï‚”. Rua Hakodesh(Holy Spirit) and YHVH are one. YHVH, Yeshua and the Ruach Hakodesh are deity – they are the only deity – they are not separate, they are one. Man tries to wrap his mind around this and can’t. How can Yeshua be the son of God and also be God? Wasn’t Miryam found to be pregnant from the Ruach Hakodesh(Holy Spirit)? How can Yeshua call out to God on the execution stake and be one? Who knows the mind or workings of God? His ways are not our ways. His thoughts are not our thoughts. He is Creator – we are His created. He is the one true God – the only God! The purpose of the text is to show us how we fall short – to help us understand why we fall short – and that apart from God’s mercy, favor and chesed (loving-kindness – covenant faithfulness: ie, grace), the original sin that is our nature and our curse is the reason we fall short and will lead only one place – death. The text is NOT a book of do’s and don’ts that you make check-marks by to show how righteous you are or are not. It is a blueprint for loving God! It shows us how to have a relationship with Him. It shows us our sin so that we can repent (do a 180 – go the opposite way) from that sin and turn to God. Yeshua stated this very thing: Turn to God from your sin! Yeshua was saying, Repent! It is a central theme throughout the entire text. It is through daily repentance and trust that we able to claim the gift, from God, of eternal life known as salvation, that He gave us through the sacrificial atonement of His one and only unique son, Yeshua HaMashiach (Jesus the Christ). Only through Him can the curse that is death be defeated. Kids: Yes, kids are part of fellowship. They are part of the body. We do not believe they should be seen and not heard. Yeshua(Jesus) taught us that if we want to welcome Him, we must first welcome the little child. They play a part in our worship – they have a part in our worship. It is important for kids and family to be together for part of the service. They need to see their parents worshiping – they need to see the body worshiping – they need to be part of that worship! When you arrive for service, kids accompany their parents. Please sign them in and keep them with you. After we have praised our Lord in song (and dance if you or them so desire, because David danced before the Lord), we will have a children’s lesson at the front of the congregation geared towards them. When that lesson is over, they will go sit with their classes in the congregation to sing the worship song they have learned or are learning in their classes for that month. Their teachers will then take them to class. Each month, the children learn a single worship song that we sing in church. We play that worship song each week that month in service right before they go to their classes so that they can participate – so that they can worship! Children learn from modeling. Children learn from example. It is our goal that they learn the songs well enough that we can have a least one service each year where they know all the songs and can participate and worship singing all of them to the Lord with their families. We would encourage parents to play the songs at home and help their children learn them as well. Children will be taught the stories in the bible every week. They will learn a verse. We will stay on that story and verse until it becomes part of them – until they can apply it. This may be one week, it may be 3 weeks. They will learn that honoring their father and their mother is the first step in honoring God. It is through learning to obey and honor their parents that they learn to honor God, the Father of us all. This is my name forever; this is how I am to be remembered generation after generation. It is a life worth living. It has responsibility. It has accountability. It is commitment, not conversion. It is the believers that assemble together (ekklesia) that disciple, not the ekklesia(church as in building) itself. It is by each of them in the body living lives that are a light to the nations and by sharing the Good News that is Yeshua HaMashiach (Jesus the Christ) with those around them. We do this by discipleing those that make the choice to turn to God from their sin(repent) and call upon the name of the Lord for their salvation. Discipleship was the commission by our Lord and Savior Yeshua HaMashiach (Jesus the Christ) and therefore of prime focus to us. Each and every one of us has the responsibility of discipleship to others. Discipleship is in the way we live, the things we do, the way we talk, and in the way we act. It is living a life set apart from the world – a world that hates God. We can not love something that hates our wonderful maker, indeed, the text tells us that loving the world is hostility to God. It is studying the text – together and alone. It is witnessing to others in our talk and walk. To become a dedicated follower of Yeshua, You must be discipled. To help others become dedicated followers of Yeshua, they must be discipled. We aren’t interested in converting people to the faith. We are interested in: following Yeshua’s commands, studying His Word and bearing fruit for His kingdom – this is discipleship – this is commitment, not conversion. This is counting the cost. This is submitting to our King and His kingdom rule. We are committed to making disciples. Discipleship starts at home. Yes, home. The father has a responsibility to teach his family about the Lord. We are to do this by loving God with all our heart and all our resources. We are to have His Words in our heart. We are to teach them carefully to our children. We are to talk about them when we get up. We are to talk about them when we sit home. We are to talk about them when we are traveling down the road. We are to talk about them when we lie down. We are to instruct our children in the ways of the Lord. We don’t convert our children, we disciple them. This is our number one mission field! The mother has this responsibility as well. Raising Godly children is discipleship. Making a Godly home is discipleship. Sharing that home, a Godly home, with others is discipleship. Yeshua celebrated Pesach(Passover) with His talmidim(disciples). This is significant because God “passed over” the houses of the Israelites when He was slaying the firstborn of Egypt. The blood of a spring lamb was marked on the doorposts of the homes of the Israelites so that the Spirit of the Lord would “pass over” these homes. Yeshua is the spring lamb for the sins of the world. It is through His blood, shed on the execution stake(cross), that we mark the doorposts of our homes and hearts, so that on the final day of judgment, we too will be spared. We do this every time we eat together. It is our daily reminder to remember the sacrifice of our Lord and King – to remember the amazing price He paid for our sins against God – to be thankful for the gift that was the curse He endured for us! Praise God, our Lord Yeshua the King! Just before Pesach(Passover), Yeshua removed His outer garments, wrapped a towel around His waist, and washed the feet of his talmidim(disciples). you also should wash each other’s feet. Washing someone’s feet is a very intimate thing. It is a very humble thing. It is a commitment to servant leadership. It is an example of servant humbleness. Our Lord and King gave us many examples to follow. He did this out of His love for us to teach us correct thinking and correct doing. None of us is greater than the other. In this, we follow His example. When we select leaders, they wash the feet of those they would serve. We must not be proud, we must be humble. We must be obedient to our Lord. When we desire to become part of the fellowship that is the Even If . . . Melekh Yeshua Koinonia, it is as a talmidim(disciple) washing the feet of the other talmidim(disciples) as our King instructed us to do. They in turn wash your feet as a commitment to serve you. We are family. We are a body of believers. Everyone is important. Everyone matters. We are adopting each other. We are humbling ourselves before each other. We are loving each other! This is a calling, not a profession. We can and should, to the best of our abilities, meet the needs of those that in this calling that have need. We don’t have a traditional pastor. We have a congregational leader or president. We have a team teaching and discipleship approach that is performed by the eldership. We have deacons. We have teachers of children. We have teachers of adults. We have a worship leaders. We have ministry leaders. Everyone is a disciple. We will not then collect an offering and present that to God with the typical 50% of it going to pastoral salaries, 25% going to a church operations (mortgage, electricity etc), 15% to Discipleship and 10% to evangelism and missions. These (4) people receive half of what the typical church takes in. If you add the operations budget of 25%, you get a building and (4) people receiving 75% of the money that a church takes in. The average church member gives $1000 dollars a year. This means that the average church of 200 will take in $100,000 for (4) people. . . It will take in $100,000 for operations. This leaves only $60,000 for discipleship and $40,000 for evangelism and missions. This is unacceptable to us. In the church in Acts, the emissaries needs were met. None of the emissaries among them was needy or destitute. All the believers were one in heart and soul – no one claimed any of his possessions for himself, but everyone shared everything they had. It is in this that we will meet the needs of our emissaries so that they are not needy or destitute. Nothing more – nothing less. How are we to give to God? Why do we give to God? How much do we give to God? Tithe means 1/10th. Traditionally this is taught to be the defacto standard. The text teaches us that we are given blessings from the Lord, such as wealth, to share with those in need so that they will bless the name of the Lord and thank Him. Does a father share only 1/10th of his income with his family? We are family. We give with a joyful heart. Everything we have is the Lord’s anyway. We share with each other as each of us are convicted to do. We take care of our family members with need in our midst as best we can. This isn’t always as a financial endeavor. It never was. We bring our gifts before His alter as an offering. Giving to God is giving to those in need. For some it may be making baby blankets for homeless mothers. For others it may be taking an individual or family into their home to help them get on their feet. For others, it may be financial. Ekklesia’s(assemblies – churches) have financial needs to be able to operate. Electricity, water, mortgage, freezers and refrigerators to hold the food for gatherings and ministries to the poor. Everyone that is part of the koinonia(fellowship) has a responsibility, as they are led in obedience and as they are able, to support the financial needs of our place of assembly. We find the only time that Paul asked for money, it was not for his needs, it was to send to the famine plagued church in Jerusalem. We find that the church took care of those abandoned by secular society such as lepers. We are to be a light to the unsaved(nations). We can not be a light if some of the bulbs in our own ekklesia are burned out because we neglect them. We can not be a light if we think our assembly is the only one the the Spirit of the Lord is active in. This is how we view giving to God. We don’t pass around a plate. We have trumpets(offering boxes) behind the curtains in the back of the sanctuary so that you may give humbly, obediently and in prayer. At the end of each gathering, we collect those offerings and bring them to the front of the congregation where we offer these gifts, our gifts, to the Lord as a congregation in exaltation! We give thanks as a body – We thank Him for giving to us that we may share with others – We thank Him for teaching us discipline and obedience – We thank Him for providing us with our daily bread. This is part of worship of Him! If being a disciple is following Yeshua’s(Jesus) commands, then immersion is not optional. Yeshua, who was without sin, was baptized by Yochannan the Immerser(John the Baptist). He gave us an example to follow and a command to adhere to just like He did before Pesach(Passover) with the washing of feet and during Pesach where He broke the bread and drank the wine. When we are immersed, we are establishing our claim to the newer and better covenant with Him – a covenant is a relationship with our Lord. It is the newer and better covenant that is a sign like the rainbow was for the covenant with Noach(Noah) or circumcision was with Moshe(Moses). It has counted the cost, it has weighed the options. It is submitting to the kingdom rule of our King as a loyal subject. It is “turning to God from our sin(repenting)” in a visual submission to His kingship! It is dying to the world and self. It is being set apart. It is a testimony. It is accountability. We have responsibilities in this relationship with our King. Immersion is accepting those responsibilities. This is why we don’t immerse children until they are of an accountable age. That age will vary by child. This is not conversion, it is discipleship. When a child is old enough(physically and spiritually) to be a disciple, and is ready to make this choice forsaking the world as a servant of their King and the accountability that that entails, they have reached an accountable age. We do baby dedications in that we celebrate and commit ourselves to that child and parents that offer them before the congregation. When the parents stand before the congregation with their child as a commitment to raising that child to be in awe of God, we as a congregation commit to raising that child to be in awe of God as well. We wash the feet of the parents and the child as a sign of our commitment to help raise, teach, love and stand by those parents and child as part of our koinonia(fellowship). We come before that child and parents with verbal commitments to that fellowship – to make their joys our joys and to make their problems our problems. We welcome this child into our family and care for them as our own. We were created by God to worship Him and serve Him. 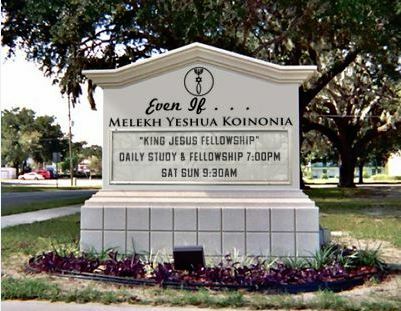 We strive to help every single person that is part of the Melekh Yeshua Koinonia(King Jesus Fellowship) find a way to serve our Lord so that they can be what they were created to be. Most ekklesias(assemblies or churches) have 10% of the body serving the other 90%. That means 90% of the body does not want or is not able to be or do what they were created by the Creator to be or to do. We strive to help each and every member of this koinonia find a way that they can serve our King and be what God created them and us to be whether that is serving our fellowship, serving the homeless missions, serving or helping another fellowship that has need – there is a place for each of us to serve our King using the spiritual gifts He gave us. 100% service is the goal of this fellowship – nothing more, nothing less. This should give you a good idea of who we are. We are not just an ekklesia(assembly) of believers or church as it is more widely known, we are a koinonia(fellowship) of talmidim(disciples) and all that is entailed by that. We follow no man-made doctrines or creeds. We are not traditional. We are not seeker sensitive. We meet daily. We share a meal. We discuss our days. We share how the Lord has blessed us. We teach each other. We encourage each other. We help each other. This entry was posted in Thoughts and tagged christianity, church, Discipleship, ekklesia, even if, fellowship, gentile, Jesus, jew, King, koinonia, statement of belief, talmidim, Yeshua. Bookmark the permalink.